Nic Bishop (Covert Affairs) portrays Gates, a brilliant but troubled military genius who helped build Vega into the stronghold it has become. Simon Merrells (Spartacus: War of the Damned) plays Julian, the cunning and powerful leader of New Delphi. Julian is a cryptic man with motives as questionable as his past and will go to any lengths to protect his city. Christina Chong (24: Live Another Day) is Zoe, a member of Vega’s Archangel Corps who defected to a rebel faction. Bold, fierce and scrappy, she’s a member of the poorest class that dwells in the city’s dangerous tunnels. Olivia Mace (Doctors) portrays Laurel, the steadfast leader of the small Southern town of survivors who have inexplicably managed to insulate themselves from the fallout of The Extermination War. Laurel is deeply devout to her religious faith and is unwavering in her resolve. Luke Tyler (Chronicle) plays Pete, an energetic, bright, dynamic and eternally optimistic teenager who grew up in the apocalypse. He has only ever known a battle-torn world, so he has no memories of the peaceful past. My source of inspiration can change daily, for example Owen Jones might have written an informative and rallying article one day, and the next I hear a joke and it ignites a tone of thought, I find satire to be an inspirational medium, it reminds you to take a second glance at the world around. Sometimes, I’ll listen to a piece of music, and the words take on a new meaning, or friends offer insight in a way I hadn’t expected. I think inspiration is everywhere, you just have to stop and think. Let us all welcome another new team member to the Dominion season 2 cast: Irish actor Diarmaid Murtagh who will be playing a character named Wes Fuller. We’re very happy to announce we’re teaming up with the imaginative and wonderfully skilled Halona Holmes for the new Dominion fan project “Let’s Talk Dominion”. In the form of a video blog, it will serve as another platform for the fans to share why we are so passionate about the show. If you don’t have a camcorder, digicam, smartphone, tablet, webcam, or other device to record a video, there are other ways for you to participate, for instance by sending Halona an e-mail with your thoughts, and she will read it out in the video blog. Or send her fan fiction recommendations or fanart, and she will show it. More ideas are welcome as well. Submission deadline for material for our first video blog is March 25, 2015. The address to submit your videos or links to uploaded videos (e.g. YouTube, Vimeo, Dropbox, etc.) is halonaholmes@gmail.com. 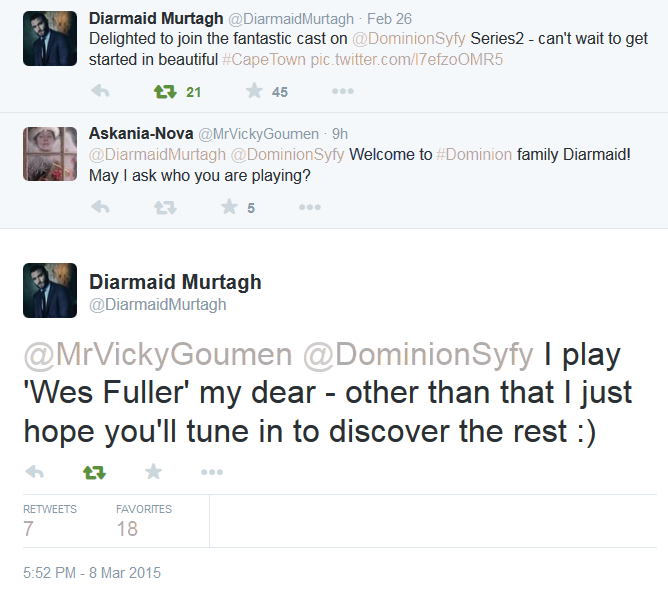 For more information, please also check our “Let’s Talk Dominion” page.